Brand, culture, design, voice. Applied Poetics is about finding clarity and meaning in our organizations. Jim Whitehurst: Don’t build a better mousetrap. Change the business model. Companies that are creating massive value typically aren’t building a better mousetrap. They’re not improving on existing technologies or simply adding new features. Instead, they’re changing the business model. 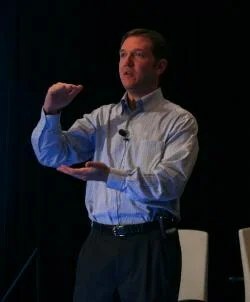 This was the message behind Red Hat CEO Jim Whitehurst’s keynote at today’s CED Venture 2010 Conference. 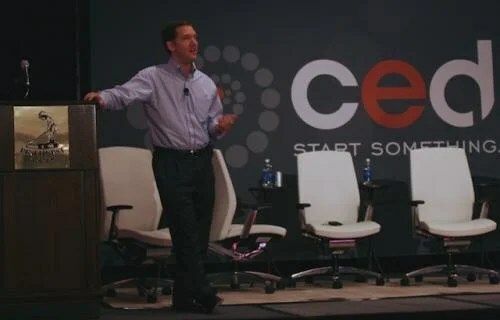 The conference, held in Pinehurst, NC, brings together more than 500 entrepreneurs and venture capitalists to discover where innovation is happening today and to find those young companies that will transform business tomorrow. A community where ideas and investments come together. To create transformative business models, Whitehurst suggests, you can start by looking at customer problems. What problems are they having today? Where are current models broken? And then working from there to change the business model entirely, and with it the customer experience. Whitehurst cites what makes Red Hat unique in this regard. The real innovation wasn’t simply around the software itself, but around the business model and changing the way software was delivered, which was enabled by the open source model and its principles. He also draws from his previous experience in the airline industry as Delta’s Chief Operating Officer. He said one of the problems with the airline industry is that they can generate massive amounts of value for society in the service they provide, but often very little value for themselves. Whitehurst believes this is one of the keys for any company wanting to build their business. They have to seek ways to not only generate value through the power of participation, but to change the business model to generate value for themselves to make the business sustainable. These kinds of opportunities to change the model exist everywhere. One example based on his own recent personal experience was in healthcare. “If there is an industry so ready for business model innovation, it has got to be healthcare,” he said. He said anyone who has visited a loved one in a hospital knows that inefficiencies exist everywhere. That’s because it’s not designed around the patient. The functional specialties are extraordinary, which meant specialists would visit at all hours of the night to perform an individual function such as checking IV lines or blood pressure. Whitehurst joked that if the airline industry worked in this way, if they hadn’t learned how to optimize their processes, planes would have never gotten off the ground. 1. The changes in technology brought about by open source and the cloud make it easy to create IT infrastructure very quickly. 2. The growing acceptance of the power of the participation enables customers to become more involved and companies to get help from the community. 2. The 21st century workforce provides people who are open to new ideas and are looking to break down hierarchy and create meritocracy. This article is also posted on opensource.com. I've always been fascinated in the tools of poets: Seeing beauty in the commonplace and crafting ideas, images, and language through the power of simplicity. This blog is about poetics applied to brand, culture, design, voice.